Russian experts disagree on whether or not a political solution in Syria is still possible. This April marks the second anniversary of the Syrian uprising. Unlike the other Arab revolutions, it can be characterized by its deep involvement of Russian interests. While Moscow remains critical of the Syrian opposition and its sponsors, Russian experts disagree on whether or not a political solution in Syria is still possible. 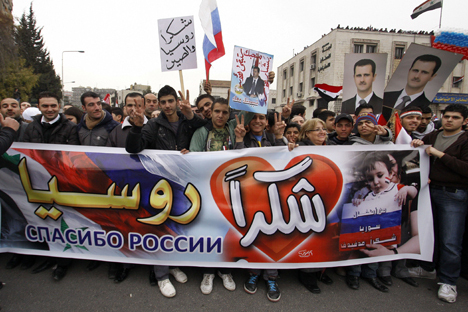 Russia’s role in Syria is widely criticized. The West and the Gulf states accuse it of unconditional support of its ally, Syrian President Bashar al-Assad. They point to weapons sales and Moscow’s reluctance to vote for any hardline resolution at the U.N. Security Council. Russia itself says it must prevent a new Libya and defend the principle of non-intervention. It fears regional stability may be shattered if Syria sinks into anarchy. The Russian leadership stresses that it is not protecting Assad, though hints that he is a lesser evil compared to rule by extremists and sectarian strife. Throughout the last months, Russia has made attempts to promote a settlement based on the Geneva agreement of June 2012 – through a ceasefire and negotiations. Minister of Foreign Affairs Sergei Lavrov met the representatives of the internal opposition and invited the head of the Syrian National Coalition (SNC), Moaz al-Khatib, to Moscow. He also held negotiations with his Syrian colleague Walid al-Muallem. In hopes of finding a solution, Russia has made attempts to reach an understanding with the United States. Both countries seek an end to the bloodshed but have different visions of the way this goal should be achieved. Washington insists that the main problem is President Assad and demands his resignation prior to negotiations. Russia insists that both parties to the conflict should be pushed toward negotiations and work out a scheme of their own. Russian-American consultations in Dublin and Geneva have even produced an unofficial draft of a peace plan involving the forming of a transitional government and free presidential elections in 2014. Moscow’s efforts did bear some fruit – Damascus officially declared its readiness for negotiations with adversaries, including even armed groups. However, the SNC eventually found a number of excuses to reject this initiative. Russia has also actively worked with the Arab League and tried to convince it to maintain a balanced position. This issue was discussed during the Russian-Arab Cooperation Forum, held in Moscow in mid-March. Yet the Russian position found support only among some of Syria’s worried neighbors and Algeria. Later in the month, the Arab League transferred its Syrian seat to the rebels and agreed that its members have the right to arm the opposition. As a result, Russia has become more skeptical toward the Syrian opposition. It is concerned that Assad’s adversaries are trying all means to involve other countries in the armed struggle. These concerns are not baseless. Moscow is also growing more critical of the external sponsors of the opposition. Lavrov stated that promises of massive foreign aid – including weapons transfers – have strengthened the hardline rebel element eager to change the regime in Syria by force. Thus, a political settlement has now become practically impossible. Experts agree that, under the current circumstances, the chances for a political settlement in Syria are small. “Currently it is hard to speak about a political settlement. More and more external players are making efforts to remove the regime; nowadays even the Arab League, which is the only significant regional organization, acts not according to its statute but in the interests of the Gulf monarchies. The international community is being pushed toward the Libyan scenario. We might expect that the League will ask the U.N. to authorize military intervention,” says Marina Sapronova, professor in the Moscow State Institute of Foreign Relations Department of Oriental Studies. “Right now a political settlement in Syria is simply impossible," says Yevgeny Satanovsky, president of the Middle East Institute in Moscow. "External investors that have spent huge amounts of money want the destruction of al-Assad and the Alawites. We should expect genocide of the Alawites and other minorities – namely the Christians and the Armenians. However, Russian analysts are not all in agreement on the future of Syria. “Negotiations are the only solution. The rebels could capture Damascus and kill al-Assad; but this will not end the war, since the Alawites will keep fighting for their survival. Anyway, the parties will have to work out a formula for coexistence,” says Sapronova. Satanovsky believes that this is a part of a larger process. “This is happening not only in Syria but in the whole region. States created artificially by the colonial powers are beginning to fall apart one by one."